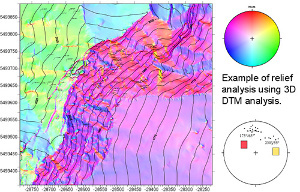 The design of a program of topographic analysis based on digital elevation model (DTM) is presented here. This software COLTOP-3D can be used to analyze the structures, especially faults, shaping the morphology. Maps as well as stereonets displaying colors depending on the orientation will be implemented. Histograms of topographic surface are planned. The design of tools useful to analyze topography in a structural way is planned. Faults tracing will be implemented based on orientation and surface points. The functions and the main points of the project are presented.